That was quite a weekend, wasn’t it? Two Modern Grand Prix and neither was won by a Tier 1 deck. I’ve said it before, I’ll say it again: Modern is wide open! You can play anything and win. The key to success isn’t positioning and metagaming, although both can help, but rather practice and mastery of your deck. Take ownership and you will be rewarded. While the Top 8 results from both Los Angeles and Charlotte are interesting in and of themselves, they’re likely to be discussed and remembered more for what isn’t there, specifically the severely over-hyped Nahiri, the Harbinger. I’m sure that we’ll be seeing plenty of excuses/explanations for this from Jeskai enthusiasts over the next week, but I’ll tell you up front that I am not surprised that Nahiri didn’t meet the hype. I’ll get to why later, but first lets take a look at the Top 8 results. I’ll try as much as possible to stick to qualitative analysis since quantitative is Sheridan’s domain and he’s better at it than I am. First things first, well done Simon Slutsky! The Merfolk School is proud of you! You showed the world what we already knew about the power of Fish. This may not silence the critics or get those who dismissed us to take us seriously, but now we’ve got the results to back up our experience. Bravo! Especially since you had to go through not only Abzan Company and Bant Eldrazi, but also an Affinity player who was running hot (seriously, did you see his on-camera keeps? It’s not normal for Affinity not to mulligan at least once). On a frankly petty note, I would especially like to thank Simon for not playing Harbinger of the Tides. It’s nice to be vindicated. On a more serious note, and this also goes to anyone thinking of picking up the deck themselves, Don’t! Activate! Vial! On your turn! Unless you’re vialing in your lord to swing through blockers you never use Vial on your turn; save it for your opponent’s end step. Doing otherwise just gives the opponent free information and exposes you to sweepers, like what happened game two in the finals. Had Simon held back and waited, Ethan’s Whipflare could have been blanked. If you have to use Vial so Silvergill Adept can find you lands that’s one thing, but you don’t then play additional spells when your opponent could have a sweeper. Just don’t. Looking around the Top 8 we have an interesting assortment of known proactive decks joined by Grixis Control. I am not particularly surprised by this. In a format as wide as Modern and as open as a GP, control suffers from having to focus on too much and spreading itself too thin, which make Corey Burkhart’s Top 8 very impressive. His deck was also the only one from either GP to use an unbanned card in Ancestral Vision, which I also don’t think is a surprise. As I’ve said before, its home is in slower control decks that play a lot of spells in a turn and Grixis has always been the deck that most easily takes advantage of Vision. Still, fighting your way through a field as diverse and proactive as the LA field is an impressive achievement for any control deck, so well done Corey! You’ve made Trevor proud. Reactive decks can work when you correctly identify where the field is going and show up prepared to interact effectively. Burkhart did this by focusing his deck on one-for-one creature removal and dropping Tasigur, the Golden Fang as quickly as possible in a field full of creature decks (the Top 32 has very few non-creature combo decks). If you’re unsure about the field, just play a proactive deck. At least then you can ignore whatever weirdness the opponent brings. Coralknight, Ad Nauseam, Death’s Shadow, and Bring to Light Scapeshift (whose name I propose changing to Bring to Shift until someone thinks of an appropriate breakfast food to rename it)? Why were we watching the aggro field in LA when all the interesting and usually unseen decks were in Charlotte? Curse Hasbro! And its poor bottom line, for squeezing Wizards’ marketing budget! Secondly, while I’m a little surprised that a deck as fragile and frequently clunky as Ad Naus (which should also be renamed, preferably to include a boring or repetitive breakfast food) made it through the Swiss, taking a look at his Top 8 competition I’m not surprised that Andreas Ganz won the tournament. I’m surprised because during the Swiss, counterspells, targeted discard backed by a fast clock, Meddling Mage, and fast aggro are all hard for Ad Naus to beat (Merfolk is very good against it for those reasons). The deck fails if it doesn’t resolve the namesake card, has no backup, and cannot always go off in a timely manner. But if it doesn’t just die it can effectively ignore everything the opponent is doing without fear. It just has to resolve Ad Nauseam, not die somehow, and then win. It’s a nightmare for other combo decks thanks to Angel’s Grace but it also loses to itself more than Scapeshift does. In the semis Ganz used the somewhat controversial Spoils of the Vault to try and go off, and ended up removing his only ways to win from his deck. Things like this are not uncommon for the deck, nor is death from running out of Angel’s Graces or from poison (which gets around Grace). Infect is such a bad matchup, I’m told that I have to assume Ganz dodged it throughout the weekend. I’m not surprised that once Ganz got through Swiss he cruised to victory, because the Top 8 was primarily midrange decks and slower combos which are good matchups for Ad Naus. Ganz had to beat Bring to Shift, Kiki-Chord, and Naya Company, none of which can race him. Only Shift had relevant maindeck disruption, though not in great quantity, and Pact of Negation neatly answers counters the turn Ad Naus goes off. 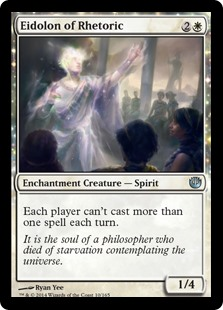 Robert Graves’ Eidolon of Rhetoric was the best card against Ad Naus present in the Top 8, but he didn’t see the card in games two or three (assuming he boarded it in at all) so it makes sense that Ganz just did his thing unimpeded. Maybe if he had hit Death’s Shadow or a Jund deck things would have been different, but given the brackets that was unlikely to happen (though the lack of coverage makes that hard to accurately evaluate). Ganz had go through plenty of aggro and Jund to get there in the first place so he presumably knew how to beat them. Interesting note about Lightning Storm: anyone can use the charging ability. This means that as a Merfolk player I’ve won by discarding a land and redirecting the Storm to Kira, Great Glass-Spinner to counter the spell. Food for thought. I’m also impressed by Eli Kassis’ Coralknight list, even if Wizards has given it a far less evocative name. I’ve been testing Coralknight myself and it always felt like a worse version of Abzan Company since you couldn’t find the combo with Collected Company. Eli appears to have made up for this with Courser of Kruphix and Westvale Abbey, the former enabling him to get lands out of the way and the latter letting him use all the Collected Company fodder and mana dorks when he can’t win the aggro or value game. It’s a solid deck and I’m impressed by the result. Keep an eye on this one, it might turn out to be what brewers have been looking for. While I have no way of knowing if this is true or not, the Charlotte Top 8 looks like it’s full of pet decks. There’s a Kiki-Chord deck with Nahiri, Ad Nauseam, Naya Company(!) with Domri Rade(? ), Bring to Shift with Hunting Wilds, and Coralknight—even the Jund decks show tremendous variation which can only be described as personal choices. If LA was about being proactive and fast, Charlotte was about experience and ownership. The players who had tuned and refined the decks they were experienced with were rewarded. Conversely you don’t see many stock or metagame lists even in the Top 32 (whether this applies to Infect is a matter for debate). The lesson then is that the work you put into Modern over the long term is rewarded, so you need to pick your deck and stick with it, even if the pros are only slowly catching onto this fact. So remember all the hype surrounding Nahiri, the Harbinger in the lead-up to last weekend? The cynically skeptical among us are going to point to only two copies of Nahiri cracking the Top 8 this weekend as proof of her weakness and derisively mock those who thought she was the Chosen One to Bring Back Control. The more reasonable skeptic might argue that the right list hasn’t been found yet and that the potential is still there given there were a combined four dedicated Jeskai Nahiri decks in the Top 32s. Those that bought in are probably worried about their investment and regretting paying the rather exorbitant price Nahiri currently commands. So what happened? I was never on the Nahiri train, partially because I’ve been burned by hype enough to never buy in anymore, and partially because the combo with Emrakul, the Aeons Torn looks like a Christmasland scenario. Its tempting to just make a blanket statement like, “It’s too slow,” or, “It’s not the combo you think it is,” and just call it a day. But I like to think that I’m better than that and you expect more from me, so instead lets start by unpacking the Nahiri combo. Nahiri, the Harbinger is a four-mana planeswalker with four loyalty. Her first ability gives her two loyalty and lets you discard a card to draw a card. Her second ability lets you spend two loyalty to exile a tapped artifact or creature or any enchantment. Her eight loyalty ultimate lets you search for a creature or artifact, put it directly onto the battlefield and then return it to your hand at end of turn. This means that you go get Emrakul, attack for 15 and make the opponent sacrifice six permanents. Thanks to the fetch/shock manabases of Modern this is usually enough damage to win on the spot. If not, it usually gets the concession anyway by wiping the opponent’s board and making it impossible for them to come back. You’ve probably noticed that I included a number of qualifiers about that combo with Emrakul. There is absolutely no guarantee that the ultimate will win you the game, and I don’t just mean combo decks using suspended Lotus Blooms to get around the annihilator trigger. Against sprawling boards and decks that don’t damage themselves, a single Emrakul attack will not win the game nor will it turn around a losing position. It’s also possible to prevent Emrakul from doing anything thanks to Cryptic Command or Hallowed Moonlight. I never thought a single Emrakul hit was good enough, and if that’s how you want to win a game there are much better ways of going about it. Then there is the issue of investment. To pull off the combo takes three turns, two of Nahiri ticking up and then one to ultimate her. That’s a long time. If anything disrupts Nahiri, even a little, then it takes a lot longer. Those turns are all draw steps that might find a permanent answer to Nahiri or simply turn around the game for your opponent and let them race the ultimate (say, a removal spell for a blocker or a haste creature). Control players know that in Modern it doesn’t take much for you to lose control, and the time between resolving Nahiri and tutoring for Emrakul might be all the opponent needed to get back into the game. I want my win conditions to force my opponent to answer them when they resolve or die, not give them the opportunity to draw out of it before I actually do anything. Besides, if you’re in position to pull off the “combo” you’ve probably got things well enough in hand that any win condition would have done it, in the same or less time. Hence I never thought the combo was necessary, and there are more reliable ways to win out there. The final issue I have with the Nahiri “combo” is answerability. When you resolve a Baneslayer Angel and your opponent kills it, that’s not so bad as long as you have another in your deck that will require another answer. With Nahiri, that works against cards like Celestial Purge and Dreadbore (which actually was played last weekend), but there are other cards that answer the entirety of the combo with a single card. Grafdigger’s Cage turns Nahiri from your win condition into a value engine, which is not bad but it can’t actually win you the game. Pithing Needle (which I think is criminally underplayed, by the way) is even worse. A single Needle creates five dead cards in the combo deck (how likely is it for any of the Nahiri decks to hardcast Emrakul? Be honest with yourself). Had Jeskai Nahiri performed well this weekend, I would currently be advocating that all of them maindeck Engineered Explosives or Wear // Tear just so they don’t lose to that maindeckable answer to their entire combo. Yes, other planeswalkers have the same problem, but those decks have additional win conditions for that very reason while that isn’t true of most Nahiri decks. In short, relying on Nahiri combo to win you the game requires too much to go right for me to consider it viable. Sorry control players, but you should file this latest hype train alongside Thopter combo and Ancestral Vision in the disappointing and overhyped bin. Nahiri herself isn’t that bad and could definitely continue to see play in a more traditional role. The first two abilities are very reasonable and the utility is enough to justify the investment. It isn’t impossible that going deep and playing madness cards with her is a viable option. What she should be used for is a value engine that, when circumstances allow, can tutor for whatever win condition you’re already running. I’ve seen Mardu lists that use her to tutor for Grave Titan and that seems like the actual optimal use for her ultimate. Make two zombies, attack for six and two more zombies, replay the Titan next turn for more? That I can get behind! In other words, use her as a bonus rather than the primary win condition, and I think you’ll be more successful and also far less vulnerable to one-mana artifacts. Nothing feels worse than losing to Pithing Needle; don’t make that a possibility. If nothing else, the takeaway from the past weekend is that Modern has really and truly emerged from the grip of Eldrazi Winter. The dreaded deck is still hanging around but it is nowhere near as prevalent or dangerous as it was in the past. Now is the time to get out there and explore! And learn to play your Vials correctly. I find wrongly timed activations offensive. See you next week with another edition of Welcome to Modern! I disagree about some of the statements about the nahiri-emrakul combo. The combo is essentially a more resilient version of the kiki angel combo. Its in the deck sure but most of the time it’s not the primary win condition, id wager the old uwr bolt snap colonade trifecta wins more games on acerage. Kind of like twin Nahiri is there when you need to win fast and the threat of the combo adds value in itself. I watched the affinity match day 1 in LA and nahiri ate about 12 points of damage before he eventually burned his opponent out. Im sure there are better shells and creatures for the nahiri ultimare but in uwr her value isn’t weighed in her ultimate alone. I play jund and the most difficult decks to play against are the ones who attack from multiple angles and uwr nahiri does that. I would dispute the comparison to Resto-Kiki. When that combo comes together it wins on the spot, while with Emrakul that is not a guarantee. I think that Legacy Sneak Attack is a more apt comparison, even if it is worse, since what you’re doing is saying “Here’s this huge thing I’m cheating into play for one attack. Can you recover?” If they can you lose the game, and that’s harder to do in Legacy than it is in Modern due to lower land counts. I don’t know if it was the same match, but the one I saw where that happened from LA I thought the Affinity player made a strategic mistake fighting over the Nahiri since the math favored him to race Nahiri. The thing with her value as an additional angle of attack is that I think there are better, more reliable ways to do that in Jeskai. Geist of Saint Traft is a classic option, but things like Bribery and Keranos are arguably more powerful and don’t have the vulnerabilities of Nahiri or the uncastability of Emrakul. I think Nahiri herself is fine, but she should be used to facilitate win conditions that you’d play without her ultimate. Geist is often a glorified burn spell in the ‘gentleman’s burn deck’ that midrange Jeskai is. It’s just not consistent enough of a finisher, and suffers from being only good when you’re ahead. Bribery also doesn’t help very much when you’re behind. Keranos is also basically unplayable now that Nahiri exists to exile it, and it wasn’t even that good to begin with (horrendously slow). You say that Nahiri isn’t fast enough, but 3 turns is a heck of a lot faster than Keranos or Geist, AND she functions as a value engine with a built in Assassinate attached to boot! And as far as having to dedicate a single ‘combo’ card (Emrakul) that does actual nothing by itself… need I remind you that Splinter Twin played a full 4 copies of the namesake card that did nothing by itself? There is a reason that I say ‘classic’ in regards to Geist because you are correct, there is a reason he sees no play anymore. Nahiri may also answer Keranos, but I was referring to the Jund matchup where that’s not a relevant consideration and where Nahiri is far more vulnerable than the god. The thing with Twin vs. Emrakul is that you could cast Twin on any creature for value even if it didn’t win the game immediately. Emrakul cannot reliably be cast by any Jeskai deck. It is a dead card without Nahiri, who is quite vulnerable. Twin needed any creature to do something (I’ve seen it put on Wall of Omens as a draw engine), and so it was much less dead than Emrakul is. Unless they have a bolt or anything that kills a creature with 2 toughness – but other than that Kiki “wins on the spot”. There were several Nahiri decks in the top 32 of both GPs. Only top 8’s are important to you? Seems to against the data driven nature of this website. I think your dismissal of Nahiri (and especially the tone you used throughout your article) is pretty unhelpful for the modern community. Saying emrakul doesn’t win on the spot isnt really honest. Technically you’re right if for some reason your opponent hasn’t fetched or shocked and you haven’t drawn a bolt or a snapcaster and they have enough permanents on board to still kill you, you might still have to play after. But realistically if they don’t just die to the combo they are so far behind you’re probably going to win anyway. And unlike the twin or kiki combo most decks aren’t playing efficient ways to answer it main. And the narrow cards they bring in outside of cage don’t actually do anything against your plan A. Bribery is too cute and too slow, geist gets stone walled by anything bigger than kird ape, and keranos while excellent is super slow. Saying any of these are “more powerful” than a single swing from emrakul is dishonest. I get you want more value out of the ultimate but as it is it’s no where near as bad as you claim. I can agree that maybe the deck needs a plan C that doesn’t rely on burn or an ultimate though. Let’s start this off with congratulating Simon again on repping our Fishy friends on one of the biggest stages, and on getting it done against Affinity, which we all know is no guarantee. I’ll also agree with you on the Vial point, David. He might not have had to sweat that game out as much if he hadn’t activated it that turn. That said, I think it’s a tad disingenuous to claim that you were “vindicated” by Simon not using Harbinger of the Tides when 5 Merfolk lists made Top 32, and 2 of them had the full playset of Harbingers, including Valerion Lee’s list at 13th place. Merfolk was well-positioned in general at GP LA, and the card is in a flex spot (though admittedly it’s a flex spot that many of decide to use on it). I think it helps a lot more than it hurts, especially given its ability to be flashed in independent of Vial (which I have employed to play around sweepers on several occasions). I get it, you don’t like the card – but it’s not useless. Moving on to GP Charlotte, your point about experience and familiarity is well taken, especially when it comes to Knightfall (sorry, but I like that name – it just rolls off the tongue nicely). I thought that its disappearance upon the beginning of Eldrazi Winter was a bit bizarre, given that it was capable of a quick creature-based combo kill (a la Abzan Company) if it started with a T1 mana dork. Hopefully this will be the type of high-profile result that will keep it around, even if it’s somewhat of a fringe deck. Lastly, I think you’re making some good points on Nahiri in Jeskai decks. I’ve personally felt that 2 would be as many as I would run in the deck, and your arguments validate my opinion. I’ve heard some fairly compelling counter-arguments that push for 4 copies (namely that proactivity tends to pay off in Modern and that having the full playset enables you to use her as a value engine, let her absorb removal, and then slam down the copy that’s going to actually try and finish the game), but overall I think that I don’t want to be slamming down a T4 Nahiri in Jeskai, even when I intend to use her to soak up damage and use the other 2 abilities for value purposes. So I’m with you there. I’ve never said that Harbinger was a bad card, just that it’s not well positioned. It has a lot going for it, but in the current format it simply doesn’t do enough. I did also acknowledge how petty that was of me. That doesn’t address how the 13th place list, which just barely lost a win-and-in, had the full 4. If anything, I was even more impressed at Simon’s ability to pilot the list against Affinity without having it in the 75, given that I tend to win when I draw it (I’ve even pulled out some Game 1s thanks to Harbinger, which used to be unheard of) and lose when I don’t. The diversity in top 8 at Charlotte is probably attributed to the mass drop they saw day 1. That’s not impossible, though if Chris Lansdell’s article today was any indication there actually were a lot of oddball decks present from the start of the tournament. I’ve played ad nauseam on and off for a while, and actually ran into that same scenario against a fish player. I’ve maindecked a single slaughter pact ever since. yes she slightly underperformed but how well was Jeskai faring before Nahiri? It’s not that Nahiri is garbage, I acknowledge that she is a decent card, it’s that she did not live up to the hype she received going into this weekend. Starcity’s writers were going nuts over the card, with Tom Ross predicting that it would be the next card banned in Modern. I’m not saying that Francis Cellona’s result was luck, but that was also the only Jeskai list in the Top 32 of LA which indicates that the hype surrounding the deck was misplaced at best or simply wrong. In Charlotte I expect that this will turn out to be like Gerry Thompson’s Thopter Gifts deck because, as Shaheen Soorani pointed out, it’s mostly equivalent to Thopter combo and I predict it will see the same amount of success. Nahiri, the Harbinger is a fine card, but the combo with Emrakul is not reliable enough to warrant being your win condition. It’s just not resilient or reliable enough to warrant playing a card that you will never cast in a control deck. I think the Jeskai shell is fine but it’s still looking for its win condition. The shell sans Nahiri was doing reasonably well and I believe that all Nahiri has actually done is convince more people to pick the deck up. Even if the combo doesn’t pan out, there should be an uptick in Jeskai players who bought in based on it. This is shown by Jody Keith making Top 32 in Charlotte with a Jeskai list that used Ajani Vengeant and Gideon Jura instead of Nahiri. I didn’t see a single Jeskai game in the coverage where the combo won a game where a more traditional win condition would have lost (not saying it didn’t happen, just that I didn’t see it). On your weaknesses argument, what tapped artifacts are you dealing with now that you couldn’t before? I doubt that exiling a mill rock or two against Lantern is very good and they have Pithing Needle, to which the only answer game one is Cryptic Command. She’s good against enchantments but how many of those see play regularly? As a 1-2 of value card I think she’s fine but as an integral part of your win condition? No. Find something more reliable. This was a little weird. “Hype train derailed”? What hype were you hearing? You make it sound like people were calling Nahiri the second coming of JTMS or something and got proven wrong. Maybe I’ve been listening to different hype than you, but what I’ve been hearing is “Oh, Nahiri fills some holes in a deck that was struggling and makes it viable, that’s cool” and “Hey, turns out Nahiri doesn’t belong in the bargain bin after all!” None of that got disproven. Heck, none of it even gets contradicted in your own article. Where was all this crazy hype you were seeing? Even the article you link as a reference to the hype is making claims like “she’s no Splinter Twin” and “fills a critical gap” and “results suggest the deck isn’t bad”. There was one line that said “heralds a new era of blue control”, but one line is not a “Hype Train”. I choose to link to the free Fact or Fiction article so that everyone could see. Shaheen and CVM were the most reasonable SCG writers talking about the card leading up to the GP weekend while the Premium writers really were acting like it was the second coming, with Tom Ross in particular claiming that it would be banned. Gerry Thompson was also really talking up the combo and Sean McLaren previously declared that Nahiri was being broken in Modern. The price was talked up from >$10 to $50 in about a week despite a relative lack of results. That’s the hype I was referring to and what Sheridan brought up last week. When Toms article got released everyone was saying he was nuts for suggesting it, the hype that you claim got derailed never really existed, the hype that did exist did not get disproven at all by the most recent results. Not only did one List only narrowly not make it into top 8 on breakers in LA, there were a few more sprinkled in the top 32 of either GP. Not to forget Pete Ingrams win the week leading up to the GP. All of this seems to support the fact that Nahiri (with Emrakul) fills some key gaps in Jeskai Control and might be just what the deck needed to become relevant once more after a long absence. While it´s entierly possible that Nahiri (+ Emrakul) with either be busted or flop in Modern i think it´s more likely that it will establish Jeskai Harbinger as a solid T1.5 or even T1 deck in modern once the lists get more polished and the players more expirienced. I also saw the backlash against Tom’s statements (nicely done Sheridan leading that charge) but the fact that she’s still at $50 on SCG and $45 on ChannelFireball tell me that the hype train I’m referring to was very real and was a force going into the GPs. I think that Nahiri is a decent role player in Jeskai, as you say, but that she should not be used to find Emrakul as your intended win condition. There are easier to cast and protect options available that cannot be defeated by Pithing Needle. I guess any disagreement with this is simply pointless as you’ve basically invalidated anyone’s dissent by pre-emptively writing it off as Jeskai fanboyism. Too much promotion and arguing over pet decks really takes away from the potential of this site I think. If you read the site it’s clear the real metagame is monkey grow, grixis, and merfolk with a bunch of fringe decks running around. Let’s not get too hyperbolic here. Although some of our authors prefer certain decks over others, there are a number of pieces on this site (at least one per week) that deal with the metagame more holistically. Take last week’s article, for instance: http://modernnexus.com/metagame-guide-mays-grand-prix-weekend/. Or another published the day after: http://modernnexus.com/recapping-scg-indianapolis/. I’m sure Jason, our new site EIC, would be happy to hear constructive criticism about where Nexus can improve, but saying stuff like your last sentence is clearly off-base. I think the style and provocative language of Trevor (especially during the Eldrazi period) and now with David’s article are incredibly unhelpful. To some extent I understand making ridiculous statements makes for potentially higher clicks but overall it damages the credibility of the website..
Hello, first time commenting here, big fan of the site. In my opinion modern nexus is not only the best modern site but also most data-driven and i really like that u usually don’t jump on hype-trains and prefer more deliberated opinions. I, too, would like to say I dislike the high-handedness of the post. I really like almost everything this site does, but articles like this leave a bad taste. Holy crap, breathe people. The guy wrote an opinion piece and provided and data as evidence to how he reached his conclusion. No need to trash an author or website just because you disagree with somebody. And if you want someone to do tournament reports for ten different decks you may wanna throw a donation their way to help build a Jund deck. Just for a reference, where can I find those Mardu lists running Grave Titan you were mentioning in the article? It would appear this article has ruffled a lot of feathers. First things first, I hear your criticisms loud and clear, and in retrospect the heavy-handedness should have caught my eye—that’s my mistake as editor, and one I intend not to repeat. As for the substantive claims David makes, while I don’t necessarily agree with all of them myself, I found them plausible, which is why I decided to publish them as is. You may feel Nahiri is strong in Jeskai or not, but the reality is we simply don’t have enough data for a definitive conclusion. Even after Sheridan’s quantitative breakdown yesterday, we can’t say with certainty what the best version of Jeskai is. It’s eminently possible that Nahiri’s recent success is due to her current status as finisher du jour, rather than to any specific advantage she confers to the Jeskai pilot. Mind you, I’m not making this claim myself (personally I think Nahiri into Emrakul is exactly what Jeskai needed). But it is plausible, and worth consideration. Quantitative analysis gets us only so far, especially when our n is small. At a certain point we need to discuss theory, and when new strategies come on the scene there is bound to be disagreement over the nature of results. Magic is, after all, a game characterized by variance. What I regret about this article then is the tone. David should have been more cautious in his claims, precisely because we don’t have enough data yet. And as editor I should have caught it and asked him to temper his assertions or provide more explicit data to back them up.